Tempura is the classic deep-fried food from Japan but what’s not so well-known is that tempura was originally introduced by the Portuguese to Japan in the late 16th century. 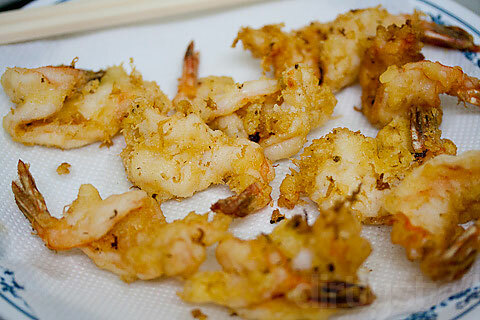 I love eating ebi tempura so on a day when I didn’t know what to cook, I decide to make my own tempura! And of course since tempura is hot, I would pair it off with cold soba! 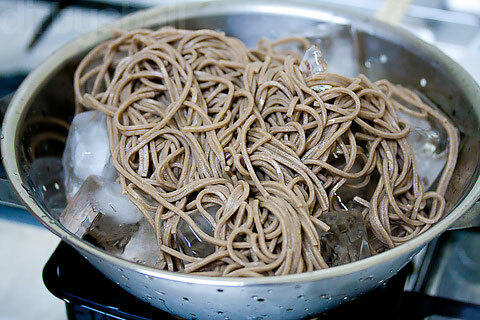 I have no idea what’s the right way for preparing cold soba so I just filled up a colander with big ice cubes and tossed the soba on it to chill out. Next I went on to prepare the batter. Good tempura needs lumpy batter, because the goal is to get a thin golden layer with the deep-fried coating, rather than a thick pancake coating. 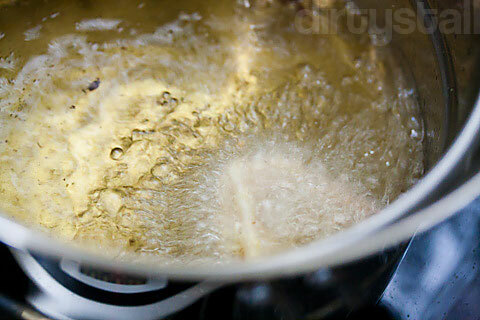 So in order to avoid having the thick and oily coating, the tempura batter should be made in small batches just before you start deep-frying. Contrary to normal belief, tempura batter should not be mixed well at all and there should still be lumps of dry flour in it. 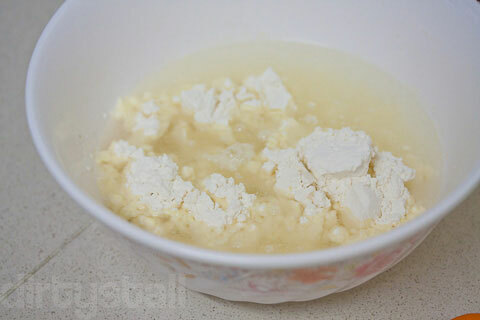 So in a bowl I lightly beat 1 egg yolk, then poured in 1 cup of ice-cold water and stroked a few times with chopsticks, then added 1cup of flour. Now I stroked flour in a few times with chopsticks again, making sure not to overmix it and keeping it lumpy. Making sure that the prawns are completely dry, I dredge them lightly in flour and then dunk them in the batter, shaking off excess batter before dropping the prawn into the hot oil. And here’s many more done! Of course it’s not as good as the one I had in Tokyo but they’ve been doing it for a hundred years! 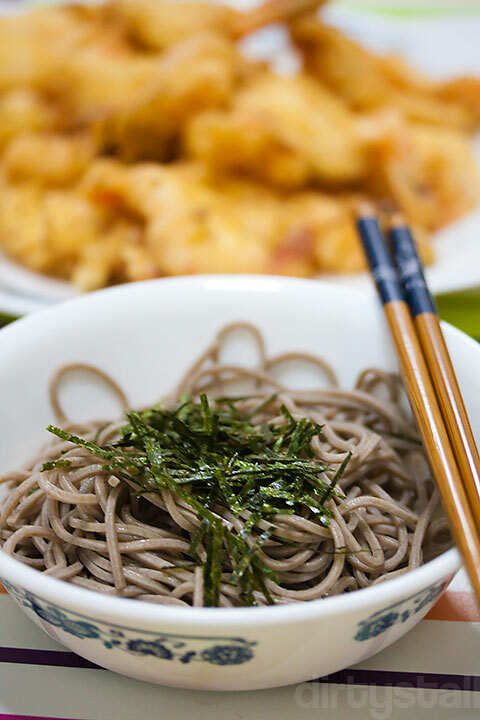 And of course it’s best eaten with my cold soba! 6 Responses to "Ebi Tempura with Soba"
Of cos can’t compare with the Tokyo ones! Otherwise, you can open your dirty stall already! ;P But still, looks good! 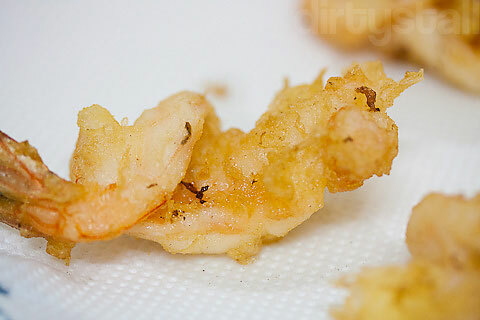 Your ebi tempura look more like prawn fritters to me lol. No dressing for your cold soba? Or did you just use soba tsuyu as dipping sauce? I think a sesame based dressing would be delicious. wahseh! such big bowl! u didnt eat all by urself right??? Hahaha no lah, made it for the whole family!